I was introduced to Rotary 41 years ago by a long time Ladner resident who was active in the Rotary Club of Ladner in District 5040. I have always wanted to be involved in the community where I could make a difference in the world and I found this in Rotary. 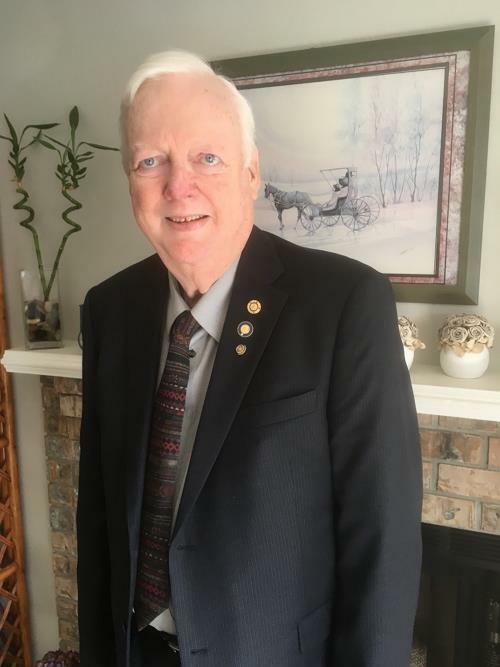 As I moved around the Province in my career, I was a member of the Rotary Club of Saanich in Victoria, the Rotary Club of Burns Lake and the Rotary Club of Kamloops. However, I finally returned to the Ladner Club of which I am Past President, until we moved to Abbotsford where I joined this club. Again, I found a group of Rotarians who have been doing great things both locally and internationally now for 68 years. The Starfish Pack program has helped many families in the Fraser Valley and it has grown across the Province and now will soon be expanded to Washington State. The Wheelchair Program, by helping one person, changes the lives of whole families. Now that the possibility exists that the wheelchairs may be manufactured within their destination country there will be an even greater impact to their overall community. Our involvement in Rotaplast and the surgeries that are performed on the children affect the lives of not only the individuals, but again the lives of families as a whole. Locally the Club supports many organizations with donations for example; Hospice, Student Scholarships, and many other groups and service organizations in Abbotsford. These are only a few of the many projects that have benefited people locally and internationally. Since I attended Pre-Pets, Pets, the District Conference cruise, the District Grants Seminar and the District Assembly I have again been reminded how much Rotary means to me. Rotary gives us all the opportunity to be a part of a united group that works for the good of all – an organization that is viewed around the world as something that can be trusted. Our mandate to end Polio is another example of our partnership that has been so successful. I would like to share with you our 2018–2019 Rotary Theme on behalf of Rotary International President Barry Rassin - “Be the inspiration”. Rassin stressed the power of Rotary’s new vision statement, and I quote “together, we see a world where people unite and take action to create lasting change across the globe, in our communities and in ourselves.” This describes the Rotary that we must build. As your president I want to say that this in not my club, but our club – those of us here in Abbotsford, those out into the world with 1.2 million of us working together to provide a better life for many. My goal in Rotary has always been change. My vision is a more unified world, a world that comes together for the improvement of all people. As your President, I am thanking you for the opportunity to serve. I serve you, the members of the Rotary Club of Abbotsford, our community and I strive to serve the world. Together we will make this a memorable and productive year.